Have cool events but no photographer to capture them? 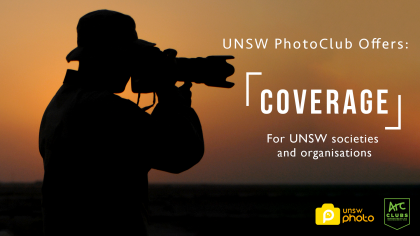 The coverage program is an initiative dedicated to helping UNSW societies and Organisations promote themselves. Contact us via the form below and we’ll put out a volunteer request to our members for a photographer to attend, shoot and provide a limited number of photos for your social media. We’ll also publish the shots on our sites, so you’ll be able to increase your student outreach even more, with access to our 500-odd members. Whether you want to expand your social media presence or just get some cool shots, we’re always interested in hearing your thoughts. Feel free to contact our marketing team at coverage@unswphoto.com if you have any questions or concerns. Description: Covering a charity yoga class that aims to raise funds to support research to cure childhood cancer. It’s a great opportunity to get event photography experience, meet new people and gather knowledge about the intensity of the cause. If interested in the opportunity above, please email; coverage@unswphoto.com along with your PhotoClub membership number for more details.